Do you know The Story of Food Waste? Back in the fall of 2017, the whole of Too Good To Go sat down together for a movie night. However, it wasn’t popcorn and rom-coms that were on the menu. It was something much more serious. Showing that day was: WASTED! The Story of Food Waste. Here’s our review. Directed by Anna Chai and Nari Kye, this documentary - produced by famous chef Anthony Bourdain - is truly eye opening to the reality and consequences of food waste. Although the movie has a serious angle when informing the viewer about the devastating effects of food waste, it also shares several alternative and promising solutions to the issue from around the world. Audiences will see how the world’s most influential chefs make the most of every kind of food, transforming what most people consider scraps into incredible dishes that create a more secure food system. It shows how any action - no matter the size - can lead to new ways of using more food, curbing environmental damage, stimulating technology and business and more. It also shows us how each of us can make small changes – all of them delicious – to solve one of the greatest problems of the 21st Century. 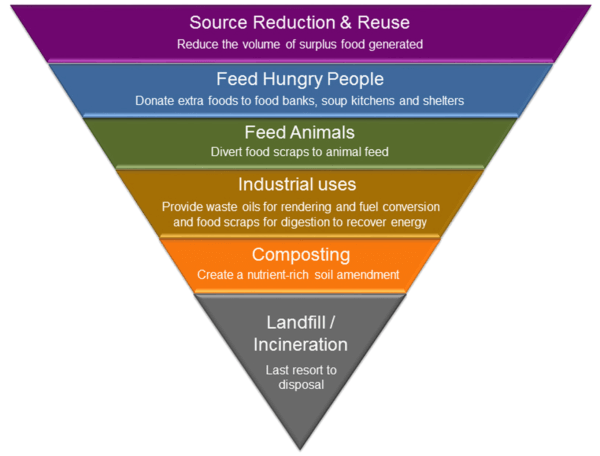 The chronology of the movie is built around at the food pyramid - or food recovery hierarchy - and which initiatives are found within the different levels of the pyramid. We are taken around the world to see which creative solutions have seen the light of day, all with the purpose of reducing food waste and finding alternative uses for food, food scraps etc. Below are a chosen few of the many, awesome solutions we are presented with in the movie. In Dorchester, Massachusetts we meet Daily Table, which is a non-profit grocery store on a mission to sell healthy food at prices low enough to actually compete with fast food. In London and Ripon, England, we go with Tristram Stuart - a global expert on food waste - to Hampleton Ales. They have created a beer made with wasted bread, and we see the brewing process and how one piece of bread is recovered in every bottle of Toast Ale. In Milan and Modena, Italy, we visit Michelling chef Massimo Bottura. We see how Bottura’s chefs minimize waste in the kitchen of a 3-Michelin starred restaurant, as well as how Bottura is passing these culinary techniques onto the volunteers at the Refettorio, a soup kitchen started by Bottura. In Murfreesboro, Tennessee, we visit General Mills’ Yoplait Yogurt Factory, where they produce 900,000 pounds of Greek yogurt daily. It takes 3 gallons of milk to make 1 gallon of Greek yogurt. This means massive amounts of leftover whey, which we see being transformed from waste back into electricity. The energy then powers machinery at the plant and pulls much less electricity off the Murfreesboro grid. In New Orleans, Louisiana, we visit the Samuel J. Green School, where Pre-K through 8th grade students participate in garden education and composting. Research shows that people tend to waste less when they are more in tune with the process of growing food. In Seoul, South Korea, they have implemented a “pay by volume” system for disposing organic waste. Residents are required to separate food waste from recycling and other household waste. The program has already reduced household food waste by 30%. The movie showed us some ugly truths about food waste. But it also gave us hope for the future to see so many, creative solutions for tackling food waste. And it definitely told us that we were on the right track with our contribution to reducing food waste worldwide. We give it 6 out of 6 lovely apples! Top image and facts are found via http://www.wastedfilm.com/.